Home » 2013 big data » responsive design » web 2.0 maturity » web 3.0 » web 3.0 maturity » web 3.0 model » Let’s Welcome 2013 – A Year of Web 3.0! Let’s Welcome 2013 – A Year of Web 3.0! With the advent of Web 2.0, the volume of data produced and consumed on the web has increased by leaps and bounds. This has brought to us some challenges on how to manage and organize the data relevant to our needs in day to day digital life. And, here the era of Web 3.0 is slowly stepping in to address the concern of managing and organizing big data with convenience that matters to us, via the cloud. 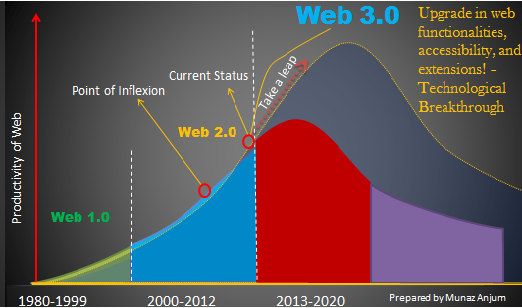 Are the IT organizations across the globe readily welcoming Web 3.0 to adopt and adapt the changes envisioned in 2013? The fast changing web technology followed by an increasingly 1:1 interaction by Gen Y with digital media is what is determining Web 2.0 to bypass its “maturity phase” before reaching its peak, and push Web 3.0 with lots of buzz & excitement. Pls, see above the diagram! I have already given presentation at my current company on Web 3.0. Here is a presentation to look at. Cisco conducted a study in 2012 that finds, on an average, individuals generate 11.5 gigabytes of data per month while average consumption of data is 32.3 GB. Around the same year, people generated 30.7 exabytes from a total 10.3 billion internet connections. Web 3.0, in simple terms, is all about managing and organizing the gigantic volume of data being produced and consumed on daily basis in a more rational and effective manner. Technology is playing an important role to make IT happen. Web Ontology Language, RDF, HTML5, RWD, and RIA are a few to name here that the evangelists are currently exploring and relying with high expectations of addressing the growing concern of organizing and managing the “voluminous scattered data” more semantically. Essentially, web 3.0 is all about semantic use of big data, and technology brings us the ‘convenience’ to access and post information to the internet. When we mention ‘accessibility’ of data or information, users explore a variety of options such as search engines, social media, subscribed websites, personalized sources, etc. Nevertheless, the most important channel to access or search information is Google, no longer a noun but a verb! While it remains to be seen how Google adapts to the changes, and overcomes the challenges brought by Web 3.0, it’s equally important to see the implications of web 3.0 on various IT organizations across the globe. Agility, Accessibility, and Adaptability, (AAA), to my understanding, are the key ingredients for any IT organization for keeping their lights on in this evolutionary Web 3.0 era. The agility of an organization represents the ‘temperament’ to adapt to the ‘changes’ by ‘acquiring’ and ‘accessing’ the rights tools and resources. Whether legacy IT infrastructure is resilient to web 3.0 or not is worth watching in 2013. However, procrastination more than a minimum timeframe towards AAA demeans our progressive thoughts! Let’s say BYE to 2012 and WELCOME 2013, a year of Web 3.0!